The fudgiest, gooiest brownies, with the deepest, darkest, most intense chocolate flavor EVER! From scratch, pantry staples, just one bowl, no mixer needed. I first discovered this brownie recipe probably close to 10 years ago. I clipped it from the food section of the Philadelphia Inquirer. Although I never knew who the original author was, I made it often, to bring to barbecues and potlucks. These brownies were always a huge hit! It’s been a while since I’ve made them last, but I knew from the first “Simply Perfect” post that I’d want these brownies to be a part of the series. Fast forward to me flipping through Alice Medrich’s “Bittersweet,” which I’d borrowed from my local library, and spotting that old, familiar recipe! No wonder it’s so dang good! Alice Medrich? She’s only been at the forefront of the gourmet chocolate movement since the 1970’s! I mean, she’s pretty much devoted her life to fine chocolate. “Cocoa powder…is made by removing 75 to 85 percent of the cocoa butter from chocolate liquor, and then pulverizing the partially defatted mass that remains. With all of the flavor and none of the fat, cocoa is essentially a concentrated form of cocoa bean. And, because cocoa beans are natrually tart and acidic (characteristics that provide fruitiness and complexity in chocolate), those qualities are exaggerated in cocoa powder. Natural cocoa powder…is bitter and strong. The best-quality natural cocoa is complex and fruity and wonderfully flavorful. Natural cocoa, with its harshness tamed by sugar in the recipes, delivers a strong hit of flavor in American favorites such as brownies and fudge. I prefer this brand of cocoa. It may or may not be the cream of the cocoa crop, but it is considerably better, IMHO, than lesser brands such as Hershey’s or Nestle (side note: Hershey’s Special Dark Cocoa may be black as night but it has very little chocolate flavor). And I like it because it is readily available in my local supermarket, and not too expensive, considering the higher level of quality. I can definitely taste a difference in the rich, fuller-bodied chocolate flavor of my baked goods. 🙂 If you really want to go all out, with some of the highest quality cocoa available, some other really reputable brands include Scharffen Berger, Merckens, and Guittard. Stir the butter, sugar, cocoa, and salt together, over simmering water, until melty and hot, add the vanilla (off the heat), and beat in the cold eggs, one at a time. Throw in the flour and baking powder, and bake the whole glorious mess in a parchment-lined baking dish. I chilled my brownies in the fridge overnight, and used a bench knife to cut them. It really helped them to hold their shape and cut cleanly! These brownies are perfect as-is, but they can certainly be jazzed up with all sorts of add-ons. Preheat the oven to 325 degrees F, and mist a 9 by 9-inch or 9 by 13-inch pan with non-stick spray. Line with parchment. Place the sugar, butter, cocoa, and salt in a large microwave-safe bowl, and microwave in one-minute increments, stirring, until the butter is completely melted and the mixture feels very warm to the touch. Transfer the batter to the prepared pan, and bake for 45-60 minutes, or until set around the edges but still soft towards the middle. Cool completely in the pan, then transfer to a cutting board and cut into squares. 1/22/2016 Update: This recipe has been edited slightly, for ease of use. Butter, sugar, cocoa, and salt may also be heated over a double-boiler. Going to make these for valentines, for all my theatre class friends for an amazing start to the year an an fantastic peter pan production! That’s wonderful Shannon! I hope you and all your friends enjoy! Wow, those look the business! Isn’t the quantity of cocoa powder a lot, though? Can we reduce it to 1 cup without compromising that much on taste? Yes it is a lot of cocoa, but no I would not recommend reducing it. All of the flavor comes from the cocoa! These brownies really do look PERFECT! And your photos are absolutely gorgeous. Thank you so much, Natasha! The photos didn’t quite come out the usual way, but I’m so happy you liked them! Thanks for stopping by and for the sweet comment. Hope to see you here again soon! These are my favorite brownies! I made them so many times and each time they amaze me! Gorgeous photos, Allie! Wow, these look STUNNING. 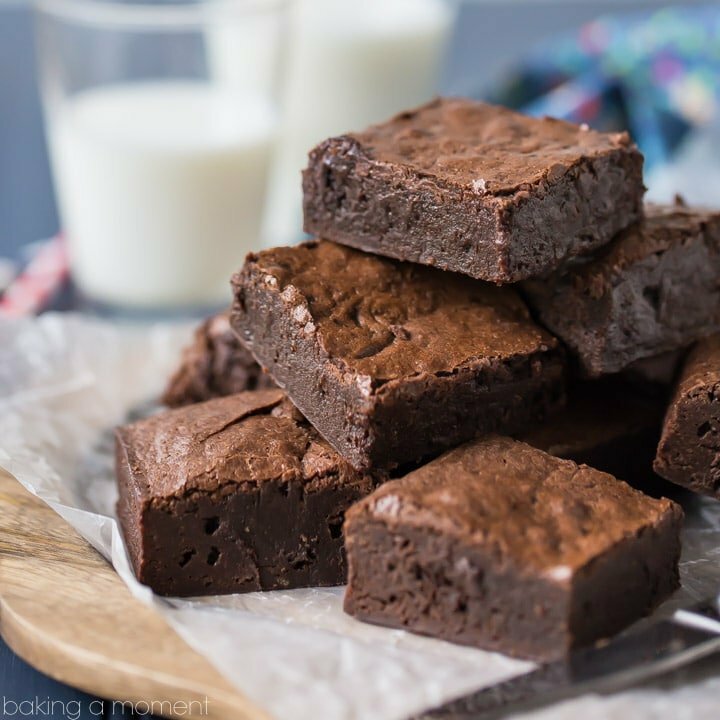 I am obsessed with brownies so these pictures are killing me right now, MUST MAKE ASAP. I’m so in love with your Simply Perfect series… I want to try all the recipes! Unluckily, no one in my family likes chocolate as much as I do, so I’m not able to eat as much brownies as I’d like :(( Being left alone with the whole pan of brownies is a bit dangerous. I am making this recipe right now for after dinner. But I was just curious, can I add semi-sweet chocolate chips too them? I’ve got a hug bag of semi-sweet chips an need too use them on some baking (forgot they were in my freezer until getting a new freezer just the other day😅) . Yes definitely! That would be fantastic! The thicker the better where brownies are involved. I’ve been wanting to try these ones for a while, may give them a go soon. We don’t get hardly any choice in UK supermarkets with cocoa powder, I use Green and Blacks 70% cocoa powder all the time. Good tip for cutting them, I always make a mess when I try and slice them. Yours look delicious Allie! Honestly, I don’t get many cocoa choices here in the U.S. either! Maybe because I’m out in the country… but for me it’s pretty much just Hersheys, Nestle, or Ghirardelli. I’ve never seen Green & Blacks but I know their chocolate is super high quality so I’m sure the cocoa must be very good as well. So happy you liked the post! Thanks Laura! It’s pretty decent! We have a lot of Ghirardelli products here in the US; I believe it’s produced in San Francisco, California. If you can get your hands on some, I’d recommend it! Wow Allie, these brownies are making my mouth water. They look so chocolaty and moist. I’m definitely pinning for later. Saw this on Show Stopper Saturday. Thank you so much for pinning, Joybee! I think you will really enjoy these brownies, they are super gooey and chocolatey, and so easy to whip up! So happy to have you stop by from Show Stopper Saturday! So happy you like them Shavaun! Oh my goodness! These look absolutely incredible! And I love your photos! These look like pure chocolate heaven! I can’t wait to make up a batch. Oh man! I’ve been looking for the perfect brownie recipe and you have it! *cries with joy* I love you so much! I think you’ll love these brownies so much! This recipe has been my go-to for years, and it never fails to disappoint! I think it’s every bit as easy to make as a mix, but so much more flavorful! I really hope you enjoy it, and stop back to let me know your thoughts when you’ve had a chance to give it a try, k? Thanks so much for reading, Eileen! how many bars does it yield? oh dear it looks like i can finish all of them! Hey Poldi! It really depends on how big you cut them. It’s a 9×9 pan, so you could get anywhere from 9 to 16 servings. Hope you enjoy! Allie, grrrrrl. When I first saw these photos at IFBC, sitting right next to you, I was blown away. Now that I have the time to really go through this post and marvel over your beautiful photography and fabulous writing, I’m even more impressed. I looooooove these brownies (the chocoholic in me is going crazy right now) and your blog is awesome. I’m so so so happy I got to meet you at IFBC and spend time with you. I just read your about page and I’m thrilled to realize that you were one of the bloggers for YinMomYangMom which I used to read religiously. How cool is that? Anyways, get used to me stalking your site and posting comments! Let’s keep in touch, kay? Definitely! I will be following you too, for sure. I loved meeting you, talking shop, and hanging out. You’re super fun and smart and talented! I can’t believe you knew me from my old blog! How random! Thanks for all the sweet compliments, and I’m really looking forward to growing our bloggy friendship! IFBC FTW! These brownies look PERFECT!! I LOVE making brownies, especially fudgy ones. YUM! I cannot get over how dense and fudgy and chocolatey these brownies look-DEFINITELY perfection! I love me a good brownie recipe! Pinning these and giving them a try – love how these brownies look nice and dense in the middle and crisp on top. That’s my favorite! Oh, I loooove brownies that are simple to make, and come out rich and dense as blocks. These look just perfect in my book! Thanks for linking these to Saturday Dishes. Check in tomorrow as we feature chicken dishes. My pleasure, Linda! Hope you’re having a great weekend! Oh man, these look cRaZy! So yummy, I bet. I once made a batch that called for 5 sticks of butter – F.I.V.E. sticks of butter!!! I’m happy to see your batch requires half that amount. Haha. These look divine, I can’t wait to bake them! One question – if using a 9 x 13 pan, do I need to adjust the cooking time? It seems like it should make a difference when using different sized pans. My plan is to double the recipe and use a 9 x 13 pan. What are your thoughts? OK! I swore I would stick with my brownie recipe forever. But now I saw these and I think I’ll have to go back on my vow that I made to the brownie God. Alice is pretty good but your photos make these shine! That is such a sweet thing for you to say! Thank you so much, you put a big old grin on my face… <3 You'll have to let me know how these stack up with your old favorite! I hope you enjoy them as much as I do! Have a great weekend, Abbe! These brownies look so fabulous!! Thanks for linking up with What’s Cookin’ Wednesday! I’ve just popped these in the oven, I can’t wait to try them! Quick question, how smoothe and glossy should this look. I thought I let the initial batter get hot enough, but it never lost the granulated sugar look. After the cold eggs were added it did get smoother and glossy but didn’t look like your picture. Will this cause problems? I put the brownies in the fridge overnight as you suggested – super easy to cut and YUMMY. I brought the brownies in to work this morning, they were all gone by lunch time and I’ve emailed the recipe link to several people. These were awesome and I’ll never make box brownies again. hi again allie im about to try this recipe i was wondering if it wont come up too sweet with the 2 1/2 cup sugar in the ingredients? i have issues with sugar, the other recipe i used the brownie ended up grainy and too sweet. Hi Nin! The correct amount of sugar for this recipe is 2 1/2 cups. That is how I’ve always made it and that’s what you’d need in order to have the fudgy texture and crackly top that you see here. You can try reducing the sugar, but that would throw the chemistry off and I’m not certain what kind of results you’d end up with. I can’t wait to try these. I have been looking and looking for my perfect brownie. Unfortunately I have yet to find it. They look decadent and delicious. I have these brownies in the oven as I type. I’ve used a 8×8 in pan – they’ve been in the oven for an hour and still aren’t baked through! Any thoughts? I followed the recipe to a T. I’m not sure how long I should let them in there! I’m getting lots of cracks in the top too! Hello! Just wondering if you’d know how this recipe might come out using Splenda instead of sugar? I know that sugar causes that sticky oh so good gooeyness we all love with our brownies! But I’ve recently been diagnosed with diabetes and would love to try this recipe using Splenda instead of the sugar. The recipes I’ve found for sugar free brownies don’t look all too promising. Any advice? And thank you for such a yummy looking recipe! No, there’s no oil, there’s melted butter. Can I substitute oil, or will that mess things up? I’m so sorry Connor, I can’t really say for sure. I’ve never tried doing that. Well, thank you for skipping over my comment. I suppose my question was simply too complicated for you to answer. Good days to you madam. John- First of all, please accept my apologies for missing your original comment. With over 60 comments on this post (which is a blessing), it’s easy and understandable for things to get lost in the shuffle. I think most would agree that it was an honest mistake. Secondly, did you happen to notice on my home page that I have been recovering from surgery this week? Your comment came in 2 days after I came home from the hospital. I have been bedridden for most of this week, and was heavily sedated on the day you asked your question. So many of my readers have been so supportive and understanding, and have encouraged me to take the time I need to heal, and that is why the blog was turned over to guest posters for the week. To answer your question, I have never tried substituting Splenda in this recipe. I would certainly encourage you to give it a go. I’d love to hear about the result, as my husband is also diabetic. I’m sorry to hear about your recent diagnosis. Mr. Allie has been living with diabetes for 2 years now and it’s well controlled with oral meds. I wish you the best. 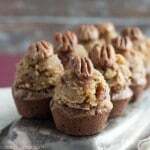 Yah know your Brownies would be better with walnuts,,,, Try puttin a lil nut in your brownie. In the oven at this moment! Can’t wait! I spilled a little extra vanilla, but I’m sure it’ll be fine. I used some super high end cocoa a guest left after his 2 month visit. He is from India and I learned all sorts of great authentic Indisn dishes from him. Both northern and southern dishes. He used to make a strange cocoa and avacado drink every day; for his health nut fix. I got dizzy and felt sick when I had some, though he also used stevia and I blamed that. How interesting! I never even knew that cocoa was used in Indian cuisine. I’m sure your brownies will come out terrific with his cocoa. This recipe is all about the cocoa so if you’re using high end cocoa I’m sure the end result will be delish! Thanks so much for reading and for the great comment! Hope you’re enjoying your weekend, Eileen! These brownies look delicious, but I want to clarify something so I don’t hurt my mixing bowl. You say to put it in simmering water…it looks from the pictures that the skillet is off the stove when you put the ingredients in….is this true and the things will still melt and blend together? Also, I have a glass bowl which I don’t think I should use…or I have the metal bowl that comes with the stand mixer. Is it safe to use that for this? I don’t want to ruin any of my bowls from the heat. On another note, I made the sticky buns you posted on someone else’s blog….absolutely delicious. Thanks for sharing your expertise so generously. My pleasure, Julie, and I’m so happy you enjoyed the sticky buns! I moved the skillet off the stove just because I have really bad light in that corner of my kitchen and it makes it hard to get a good photo. I usually just do everything right in the bowl, which sits in the simmering water. I don’t have a glass bowl, so I’m not entirely sure about that. I would think that the glass bowl is probably tempered, like Pyrex, and therefore heat safe, but I wouldn’t want to tell you the wrong thing since I don’t really know for sure. My mixer has two metal bowls and I do know that those work great! I put them over simmering water all the time and they’ve lasted over 15 years. Thanks for the great question & I’m so glad to hear you’re enjoying your new mixer! These came out brilliantly. Thanks got the beautiful post. Love it, Christy! Peppermint + chocolate at Christmastime can’t be beat! I hope you enjoy! Hi Allie – These brownies are fantastic! I have made them once in 9X12 which yields 12 medium sized brownies. I have a pan that’s probably double the size, so would it work if i just double the recipe? Hi Jenny! I’m so glad you like the recipe! I’m thinking that should work just fine. You may have to increase the bake time a little though. Keep an eye on them! Good luck and thanks for reading and for the great question! It has been a while since I followed your blog but I never posted. However, I just baked these brownies! So fudgyyy and very tasty! I am making these asap! They look perfect, and sooooo chocolately! YUM!! Oh, you are going to love them!!! I’ve been making them for years and they never disappoint! Enjoy! These sound AMAZING and my dau is off to make them now. Thanks to this recipe I have discovered Alice Medrich’s books. Just got her Easy Desserts book in the mail and am drooling over it. Have a list to take to the store tomorrow so that I can start trying the recipes! Thanks so much – I read cookbooks like novels and hadn’t come across any of hers yet. If you have not read it, an old favorite of mine is The Good Cake Book by Diana Dalsass. Lots of really great cakes from the light to the dense, every one packed with flavor and texture. Never had one of these recipes fail me, and a great many are family favorites. This is an older book, so you can likely find a used copy if you are interested. We literally have brownies every Sunday! My kids are obsessed with them… I’ll totally be trying these soon! 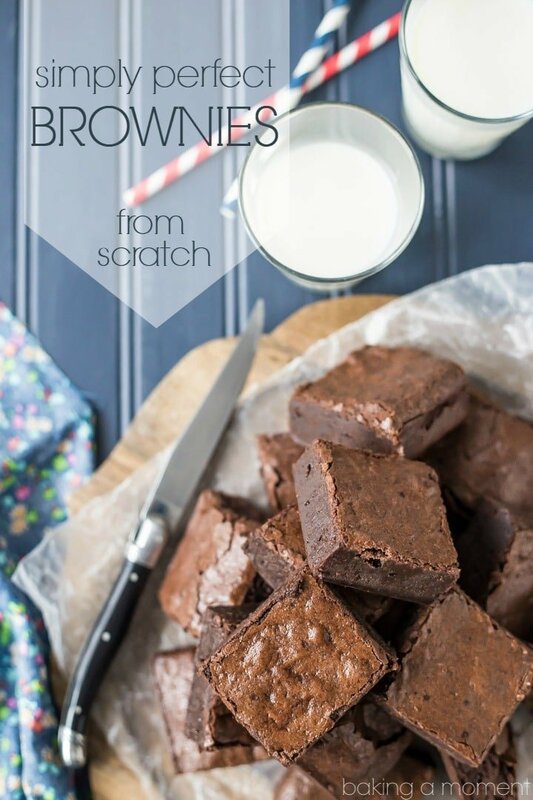 These look delicious, Allie and the recipe is very similar to my own go-to brownies. I’ll have to try to find good cocoa powder next time my family visits the states. I’ve never tried anything but Hershey’s… and sadly that’s all they sell here in Costa Rica. 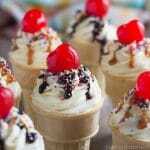 Your photos are lovely and almost making me drool! Thanks so much for the heads up, Tashiana! Were you trying to pin it from my site, with the pin-it button, or did you see it in your Pinterest feed? Oh gee I don’t know??? I tried pinning it from the page too and didn’t have any issues…??? Well thanks anyway for the heads up. They look gorgeous so I was going to try, converted everything into grams, but somehow it all went wrong… Can you help? Do you maybe have the measurements in grams? Do you do it by weight or volume? Hi Ulrike! I’m so sorry I do not have the recipe in grams! 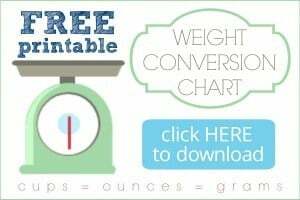 I would pull out my kitchen scale and measure it all out for you, but I’m actually sitting in a coffee shop right now with an indoor playground, trying to get my kiddos to burn off some steam lol! It’s tough for me to work when school lets out 😛 I know weight and volume are most reliable but most of my readers are more accustomed to imperial measurements so that’s why I typically post cups and teaspoons. My apologies! I also made these brownies and really thought this recipe was great! That’s so great! Thanks for the awesome feedback, Gaut! This is my favorite brownie recipe. I make it all the time with great results. I substitute flax eggs for the eggs because my daughter is allergic. They come out great. I had a problem this time. I used a metal bowl instead of the glass one I usually use. I placed the bowl in the simmering water with the sugar, butter, cocoa and salt. It never came together. It never melted. It became a grainy tough mass. I thought the flax eggs would help but it just got worse. I added the flour and the butter started separating from the batter. I had to press the mixture into the pan with my hands, and the butter stayed separated. I baked them anyway hopping it would resolve itself. It didn’t. I have a greasy grainy mess. I’m not even sure they’re edible. Any ideas what went wrong? I’m at a loss (and pretty disappointed). These brownies are delicious! I doubled the recipe and had a half bag of semi sweet chocolate chips on hand, tossed them in and used a 11 x 14 baking stone, time and temp as suggested…Perfect! Thanks so much for my new “Go To” sweets recipe! I lucked out stumbling on this, in a last minute class room party treat! Ok, I know I’m in the minority, but I don’t like dark chocolate ::gasp::. I love milk chocolate though. How can I make super dense fudgy brownies but sweeten them up? I feel like adding more sugar would change their texture. I wouldn’t add more sugar, you’ve got good instincts there. That would probably change the chemistry of the recipe. Maybe if you could get your hands on some really mild-tasting cocoa powder? Hope that helps; good luck and thanks for reading! I love these brownies and always get many compliments when I make them! 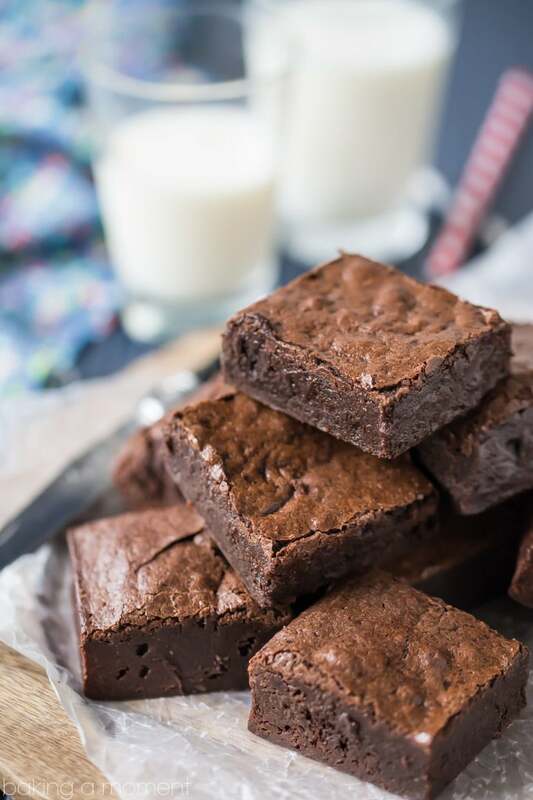 After finding the recipe on Pinterest, I have nicknamed them the “Midnight Brownies” – one night around midnight I wanted to make brownies and had all the ingredients. I have gone through a bit of a phase where I like to make goodies bite-sized/miniature. I’ve found that using a mini muffin pan and filling each with 1 1/2 – 2 tsp of batter and baking for about 25 min at the same temp makes great bites! I’ve made this about 3-4 times and my family and friends absolutely LOVED it! Thanks for this delicious recipe! I just made the brownies. They are good, but came out looking almost black. Somehow the color takes away from the experience of eating the brownies. Have you any idea what would make them look so dark? Hey Chris! I think it’s probably to do with the type of cocoa you use. I really like to use a regular unsweetened cocoa powder. I have used dark cocoa powder before though (the Hershey’s brand) and it’s extremely dark. There’s another cocoa powder I’ve used from King Arthur flour, called Black Cocoa- and it is truly BLACK black. Still delicious, but my favorite for this recipe is definitely the regular, unsweetened cocoa powder from Ghirardelli. I hope that helps! Thanks so much for reading and trying one of my recipes! Hey Chinwe! I can tell you for certain that reducing the sugar would definitely have a major impact on the outcome. Sugar is necessary not only for sweetness, but also for structure and moisture. Baking is truly a science and changing the proportion of ingredients will always alter the end result. I would stick with the recipe as-is. It’s been carefully formulated for the optimal result. I hope that helps! Question: do you think these brownies will be sturdy enough to be base of a cake? I’m not sure being gooey but I love gooey and trust your recipes! Lol! I’m doing a vanilla cake stacked on the brownie with a layer of cookie underneath. First of all that sounds fabulous!! And yes I do think this brownie recipe would work for that. It’s gooey in a melt in your mouth kind of way, but as you can see from the pics the bars hold their shape really well. Even better if you are able to keep it all refrigerated. Thanks for the great question Kim and I hope you enjoy your brownie/cookie/cake! This brownie was beyond fantastic in my cake creation! I wish I could post a pic of the inside to show you! I split the batter between two 8 in rounds. One layer for the cake. I had to keep it in fridge because of frosting, which gave brownies that dense fudgey look and feel. The second round I layered on the cookie bars with my frosting.. ohhhh my! Thank you for sharing ! I have been hunting for the perfect brownie recipe for years and have tried dozens of recipes without success. They’re either too dry, too thin, too cakey, too crumbly — until now! These are PERFECT and everything I have been looking for: chewy, gloriously fudgy, thick, with a crackly crust. ABSOLUTELY FABULOUS!! Thank you a million times over!!!! I will never use another brownie recipe again! Hi, this recipe looked amazing but when I made it (I halved the recipe for a test batch) and it was done in 30 minutes and came out almost rock hard. This was my first time with brownies – could you maybe shed some light where I may have messed up? Hey Reshma! So sorry you had difficulty. What size pan did you bake your half-batch in? Mine arent coming out so well. I followed the recipe to a T but after an hour and 45 minutes in the oven they are still wet and unbaked in the center when I stick a knife in it. I used an 8×8…should I have used a 13×9? They are starting to smell burned but are not baked through. Oh dear! An hour and 45? That’s way too long- something is definitely not right there! They won’t ever be perfectly dry in the center, it’s a fudgy brownie recipe, but an hour and 45 minutes is more than twice the recommended bake time. They would definitely burn! 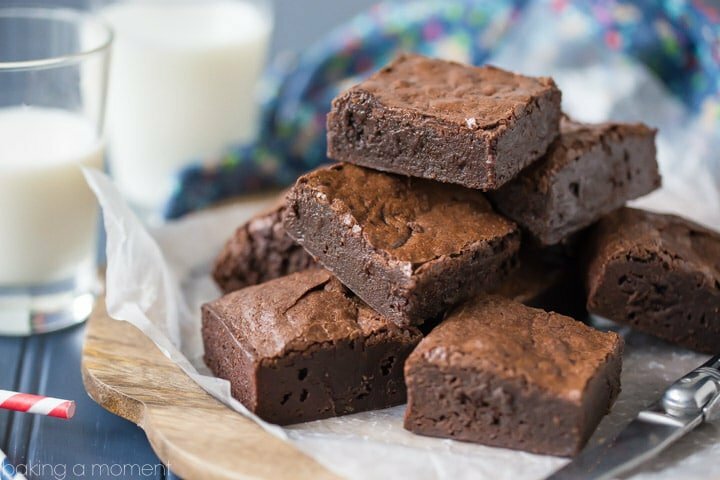 I have a from-scratch brownie recipe that I love, but the texture of these looks different, so I’ve got to try them! These look like they might be creamier or smoother! A person can never have enough options for an awesome brownie recipe, and I always love how easy they are to mix up, so this has to go on my ‘must make’ list. Such pretty pics! I totally agree Sarah! There are so many different kinds of brownies! These are my favorite, but it’s on my list to create a cake-y brownie too. When it comes to brownies, the more the merrier! Can I double boil the sugar, butter and cocoa powder? I’m planning to make this for my girlfriend. She loves brownies. Yes! You sure can, Joe. See the note at the bottom of the recipe card “Butter, sugar, cocoa, and salt may also be heated over a double-boiler.” I hope you and your girlfriend enjoy these brownies! Will it hurt anything (other than possibly changing the flavor) to use Dutch-processed cocoa? I have quite a bit of it from a sudden urge to make a candy that requires it, and now I’m looking for recipes that work with Dutch-process. I know I have to be careful with recipes that call for baking soda because the pH difference between natural and Dutch can affect rising and flavor, but didn’t know what other recipes could work with it. Hey again! Dutch processed can be tricky, you are right about that. I’ve used it quite a bit in addition to regular cocoa. So, for example, if a recipe calls for 1 cup of cocoa, I might sub in 1/4 cup of Dutched plus 3/4 cup of regular. I’ve had success with that approach, and it gives that dark color and Oreo-like flavor. If you’re just looking for ways to use up your Dutched, I’d suggest trying this recipe: https://bakingamoment.com/homemade-halloween-oreos/, or maybe something that doesn’t contain any leaveners, like perhaps an ice cream, mousse, or buttercream recipe. Hi Sima! It really doesn’t matter for this recipe because it ends up getting melted anyway. I hope that’s helpful! Enjoy! Hello. I was wanting to double the recipe but still use a 9×13 pan? Do u know How long it would need to cook for? Any information regarding doubling the recipe would be amazing. Thank u! I cannot wait to try these!!! Way too much cocoa powder. I shouldnt have put 1 3/4 cup in there like the recipe calls for. It came out too bitter to eat. I wasted all that money on ingredients. ? So sorry you had trouble Linda! I agree- 1 3/4 cups is just perfect for my palate too. Better luck next time! I just made it today and use the Cacao barry cocoa Powder. A little bit bitter and almost black. Can I reduce 1/4 cocoa and replaced flour? Will it changed the texture? I want it dark brown not black. Any suggestion please? I like the texture its perfect and I want to resolve my issue the next time I will make it again. Thank you for the recipe and I will wait for your response. ?? Hi Bea! I’m afraid I have not used that particular brand of cocoa, but it sounds like it may be Dutch process? I prefer to use a natural, unsweetened cocoa powder such as Ghirardelli. There should be a link to it within the post. I think this would give you a better result. Hope that’s helpful! Hey Vanessa! If you take a second look at the post, there’s an explanation there. If you want thicker brownies you can use a smaller pan, but I used a 9×13 in the photos you see. I would for sure reduce the amount of cocoa powder. It completely over-powers all of the flavor and when I made it it was so bitter. Sorry for the bad review! That’s ok! Thanks for reading and trying. These are my favorite but then I really enjoy a flavorful, very chocolate-y brownie. You could probably sub out some of the cocoa for a little more flour and maybe it would be more to your taste. You can use any kind you like! 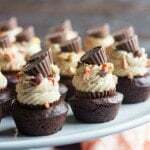 Do you use frosting on these? 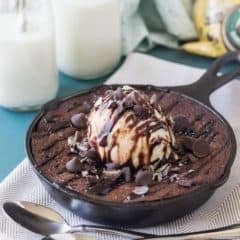 I know I’m here several years after this recipe was posted, but I just found it when searching for a brownie recipe made from scratch. I had a lot of extra baking supplies and just wanted to use it up, plus I’ve had the itch to bake lately. O.M.G. This is the most decadent brownie recipe I have ever tasted!! I added chocolate chips into the mix (using them up!) and sprinkled some powdered sugar on top…WOW. They are thick and fudgy and hold their shape well enough to actually pick them up without getting crumbs everywhere. 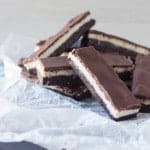 This recipe would be great for a party dessert, because you only need a bite or two, so you could cut them into small pieces! What a great recipe, thanks so much! My pleasure! I’m so happy you liked the recipe. Thank you so much for the positive feedback! I would like to try this recipe, but have 2 questions. First, am I missing it, or is there no leavening agent in this recipe? Which leads me to my next problem, which cocoa powder to use. I buy my cocoa powder from Penzey’s Spices, and have dutch process or natural as options. I gather from another comment I read that I want natural, but was hoping you might confirm that for me. Hey Chris! Thanks for the great questions. You are right there is no leavening in this recipe. The brownies come out very dense and fudgy. I prefer natural cocoa, but you could use any kind you like! Or even a combination of the two! Hope that’s helpful. Good luck and enjoy! I love your receipt. However, I have not made the brownies yet. 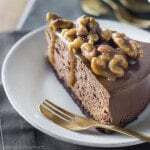 My kids loves walnuts or pecans in brownies. If adding the nuts would it alter the texture of the brownies or harm the taste? Hi Janet! If you and your kids enjoy the flavor of nuts, then that would not harm the taste. Go for it! If I just want a small batch of brownies, could I maybe do a half batch and bake in a 8×8 pan? Or would there not be enough batter? I just want a thin layer 🙂 Thanks in advance! Hey Daphne! That should work no problem but you just want to keep an eye on the bake time. A thinner brownie will bake much faster than a thicker one would. Hope that helps! Hey Annie! I make this recipe in an 8×8 all the time- it definitely works. I’ve literally done it countless times and developed several other recipes off of this one as a base. It may come high up the sides of the pan, but it doesn’t really rise much as it bakes so it won’t overflow. My pleasure Ellen! I’m so happy you enjoyed. Thanks for the info about cacao powder too- I’d love to try that! Perfect brownies. Thanks for sharing! My pleasure Rhonda! So happy you enjoyed! What brand of cocoa do you prefer? The link above goes to a blank Amazon page. So sorry about that Lori! Here’s an updated affiliate link: https://amzn.to/2yKGFdt. Hope that’s helpful! Yum! I love a good brownie and this has all of the makings of a classic! Who doesn’t love a homemade brownie! Saving this recipe to try! Made these brownies this morning before work for a lunch party. Everyone loved the brownies at work and at home. I had a go-to one bowl brownie recipe I used for years but this has just replaced it. The perfect brownie! Yay! So happy you and your co-workers enjoyed. Thank you so much for the 5-star rating and for the sweet comment! When my daughter was planning her wedding she opted for brownies and cheesecake to be served at the reception since her fiance was not a fan of cake. Your brownie recipe reminds me of the brownies that were served…they were so decadent…almost like a truffle. I can’t wait to try your recipe! I love that your daughter did that! What a cool idea. Hope this recipe is every bit as good as what you had that day! I love moist brownies! But I also love to add 1/4 cup of Hershy syrup and 1 to 1 1/2 cups of Chocolate chips to my brownies! I usually use the mini choclate chips because they don’t sink to the bottom of the brownies! Adding them just makes them a little extra special! I haven’t actually had a chance to try your brownies but I am sure they are great! That sounds amazing Vicki! I would love to try that! Oh my these are heavenly. They are so easy to make and so fudging a my husband loved them…I will make it again. So happy to hear that you and your husband enjoyed! Thanks so much for the positive feedback Terry! Do you really mean either an 8×8 or a 9×13 pan? Big difference. Yes I really mean that and as I said a larger pan will yield a thinner brownie. Just made these… AMAZING!! I added a little espresso powder but otherwise followed the recipe exactly. These will be my “go to” brownies! So happy you liked them Diane! I love that you added espresso powder. Sounds fantastic! Thanks so much for the great feedback! I have a question about the butter. Your recipe says 1 1/4 cups unsalted butter (2 1/2 sticks). Wouldn’t it be 2 full sticks (1 cup) and than a 1/2 of the third stick to make it a 1/4. Or am I reading this wrong for some reason. Yes that is right. 1 1/4 cups is 2 full sticks plus half of a third stick. In other words, 2 1/2 sticks.